Since 2004, GOAT has qualified for Club Nationals four times, with a 2007 third place finish being the team’s most impressive. Recently, Toronto has had issues staying ahead of the rising Northeast powers PoNY and Bodhi. However, 2011 brings a Worlds qualification year, and with that, many out-of-province players have returned to help GOAT take the Canadian title and show the U.S. that they are the real deal. Among these players are David Janssen, Eric St. Amant, Tim Tsang, Colin Green, Jamie Craig, Jesse Robertson, Inian Moorthy and Anatoly Vasilyev. Toly has returned to GOAT after a stint with the Swedish Skogshyddan team, who was the runner up at EUCF 2010. According to GOAT, the true story about the 2011 season is the rise of their younger talent. With players like Cam Harris, Adrian Yearwood and Thomson McKnight fresh off a U23 Junior Worlds Gold, as well as Mike Jones and Andrew Caroll winning the Canadian Ultimate Championships with the Moondoggies (CUC 2010 Finals Video – Moondoggies vs. Mephisto), GOAT is looking very strong not only for this year, but for many more to come. Anatoly Vasilyev lays out for the D at Nationals. GOAT is returning 16 players from their 2007 season as well as 6 players who joined Vancouver’s Furious George as Team Canada in WUGC 2008. 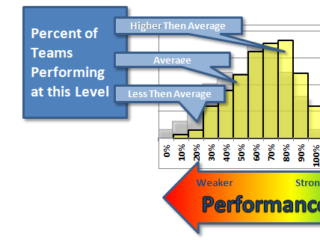 “Offensively we run vertical, horizontal and split stack sets. We are emphasizing a possession-oriented game and looking to take what’s there. You’ll recognize that as something more akin to Boston teams than our normal run and gun style. But we are adapting – we have become a far deeper team with an improving skill set. We’ve lost to Boston enough times to assume they are doing something right. Defensively, we don’t do anything too tricky. Our focus is on developing pressure on resets and disrupting offensive flow in the lanes with matchups. 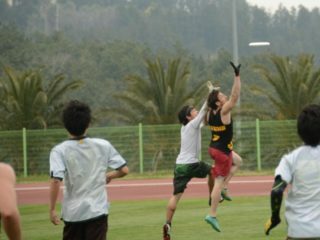 GOAT’s defensive line is led by Scott Nicholls and Patrick Mooney, who are lovingly dubbed “The Monkeys” for their short and quick pinball style of play. While Toronto may be favoring an offense designed around disc possession, a lot of their young guns will make some flashy plays. Look for Kirk Nylen, Hassell and Ouchterlony to rule the skies this fall. Scott Nicholls steps out for the around backhand at WUGC 2008. Jeff Lindquist keeps his footing as he breaks the mark in the finals of CUC 2007. “There’s a bunch of other teams vying for the spot [Canadian Worlds qualifier], so we are not discounting anyone. We have a huge amount of respect for Furious as many of us have played with them and seen what they can bring in big games. Everyone else has faced them enough times to know to not underestimate them. 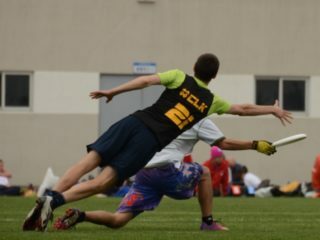 Furious has set the bar for Canadian ultimate for a long time, which has pushed us to get better, and serves as our motivation. Before the series, GOAT will be attending Colorado Cup and Chesapeake Open. Competing in Boulder is Doublewide, Truck Stop, Johnny Bravo, Madison Club, Sub Zero, Boost Mobile and LA Renegade, who will all provide Toronto with a level of competition that will be much stronger than what they will see a few weeks later in Ottawa. Also attending the Colorado Cup is Furious George, which should provide an exciting preview of the Canadian finals. While GOAT clearly has sights set on winning Canadian Nationals, they will be looking to punch their tickets to Sarasota, especially after failing to qualify in 2010. Adrian Yearwood gets sky high for this catch against Jam. 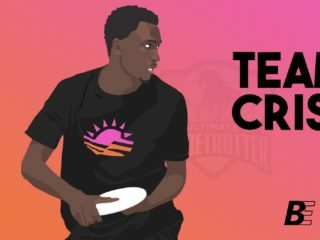 Toronto has a strong feeder system with Roy, Grand Trunk and GOAT, which has contributed to a great awareness of the sport of ultimate in the area. Much of this has spilled over into the Western NY area, with Canadian college and club teams frequently making the trip to play against their American counterparts. Also, two of GOAT’s veterans Patrick Mooney and Kirk Nylen have recently coached the junior men’s team at Worlds. Eric St. Amant elevates over two Sub Zero defenders for the grab. Stats and other talking points aside, beating Ironside and/or PoNY will be no easy task. Regardless, Toronto should not be satisfied in just qualifying for the American dance. Peaking at the right time is always a challenge…peaking twice is incredibly difficult. Though the odds may be stacked against them at times, GOAT will have an edge their American counterparts come October. Because Canadian Nationals occurs in August, Toronto’s time frame was pushed up by two months this year. Thus, by the time that all 16 teams head to Florida to compete, GOAT’s roster will have been playing together for about seven full months. With all of the top teams being so close in talent, skill and athleticism, this chemistry may prove to make the difference for Toronto. GOAT and its super-powered roster should feel very confident in their chances at taking home the Canadian title and making a serious run at Club Nationals. 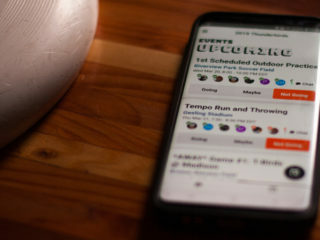 In 2007, which was the most recent qualifying year for the World Ultimate and Guts Championship, GOAT pulled off an impressive 50-7 record as well as a 3rd place finish in Sarasota. If the boys from Toronto can take home the Canadian crown as well as improve on their best finish at U.S. Nationals, they will be one step close to becoming the Greatest Of All Time.